I have to tell you, I thank God every day for my MURRAY SPACE SHOES. I Have tried many other custom molded shoes, but none come close to the perfect fit I get from my SPACE SHOES. While other shoemakers may take care to fit the arch, they still insist on squeezing my toes together to make the shoe "look good", no matter how many times I tell them otherwise. And no one else has ever made a shoe that actually fit my heel rather than hanging on my Achilles tendon. The care and precision of a SPACE SHOE, is truly unique. I run a faculty-student home, and am chief cook and bottle washer. My feet used to hurt all the time. Two years ago they stopped hurting because I started wearing MURRAY SPACE SHOES. The change was tremendous and almost immediate. Everyone owes it to himself to own at least one pair of MURRAY SPACE SHOES just to find out what a proper fitting shoe feels like. You'll agree it is the smartest investment you ever made after you've worn them. They're so comfortable. I'd like to sleep in them. I don't want to take them off. I am enclosing check to cover another pair of MURRAY SPACE SHOES. Mr. Blake was extremely pleased with your fitting, and has enjoyed great comfort. I wanted to write immediately when I got my shoes, and tell you how pleased I was with them, but then I didn't get it done and now I am glad I waited because I can tell you that I am even more pleased and wish to order another pair. Thanks again from the bottom of my feet! I'll come over and get fitted for a new pair! Enclosed is my check. Thank you for calling. Your interest in my satisfaction is very much appreciated. The new cow leathers are perfect and will get me around Europe in great shape. I only wish that I had bought my MURRAY SPACE SHOES many years ago. As a kindergarten teacher I am on my feet many hours each day. These fantastic shoes have eliminated the foot pain that I have experienced for over five years. It is a joy to wear these shoes. Once again, a remarkable job! Thank you and you’ve earned a loyal customer for life. Enclosed is a cheque for one pair of black shoes. I’ve also enclosed the prescription from Dr. Cook to take care of the sales tax. As I mentioned on the voice mail, the brown shoes are doing just great, and Dr. Cook is really impressed with the work you’re doing. Hello! Long time no see. I wear a pair of MURRAY SPACE SHOES (I named them “summer wing”) everyday. They fits my feet very well. Thanks a lot. I want another pair of MURRAY SPACE SHOE for next season. 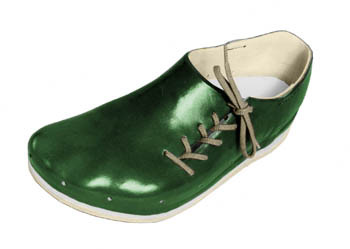 The incredible comfort of MURRAY SPACE SHOES cannot be adequately described to another person. How does one describe subjective comfort and the manner in which a molded shoe allows a natural movement for one’s own foot? I had experimented for 40 years with every expensive shoe made and to no avail. Nothing provided absolute comfort until my wife and I had our feet cast at MURRAY SPACE SHOE. I have thrown out thousands of dollars worth of walking shoes and have only Murrays now in my closet!!! My feet are very happy! 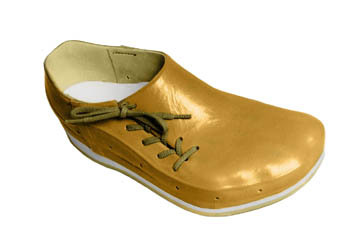 Custom walking shoes, custom hiking boots and custom sandals are molded by Murray Space Shoe.